Travel brochure for Basel, circa 1930. Photomontage by R. Spreng. Brochure for "Alpenflug - Alpar Bern - Luftverkehr," circa 1930. Click here for a full view of the cover. Travel brochure "Postes Suisses - Services d'Autocars des Alpes - Eté 1936." "Excursion Map for Central Switzerland - Bernese Oberland," circa 1932. Travel brochure for "Gottardo," circa 1931, for the Gotthard Rail Tunnel. Published by "Frobenius, S.A. - Bâle," signed "EK." Auto map "Automobile-Club de Suisse," circa 1932. Travel brochure "Winter is Switzerland," circa 1935. Signed "Ernsti." 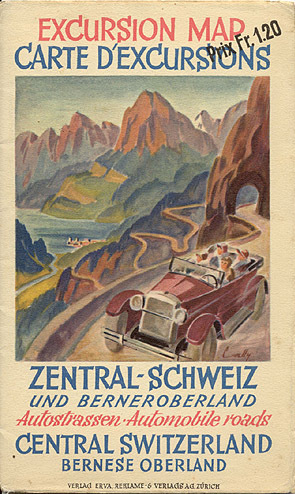 Travel brochure for "St. Gallen Ostschweiz," circa 1933.